It's time to celebrate your wonderful design requests and suggestions with an all-new Request-fest! 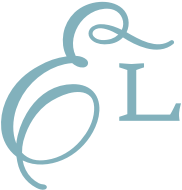 Every day we receive awesome ideas and inspiration for new designs, and are thrilled to share them with all of you! 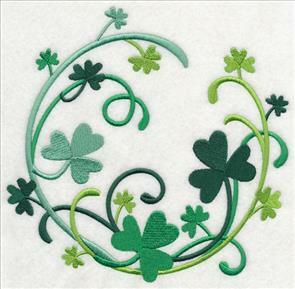 This week, see new Irish wildflower wreaths, St. Patrick's Day designs, fruit motifs, cherry blossoms and more -- all requested designs! Scroll down the page to see these exciting designs! brings life to your living room decor. Maureen liked the style of the Fresh Fruit Wreaths (and the Fresh Vegetable Wreaths! 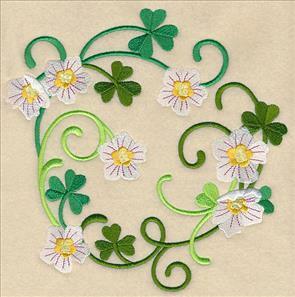 ), and requested similar designs featuring Irish flowers and greenery. 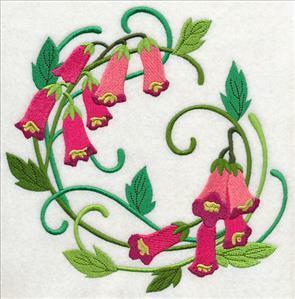 Here, forget-me-nots and foxglove shine in the colorful wreaths. 7.79" x 7.81" and 6.90" x 6.92"
Both asters and St. John's wort are native to Ireland, and bloom beautifully across its hillsides. 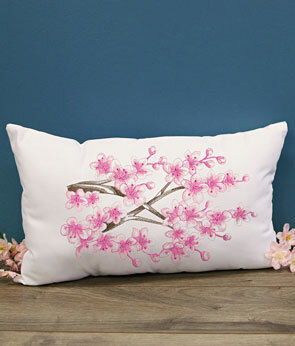 Stitch the brilliant blossoms on pillows, apparel, or even a quilt! 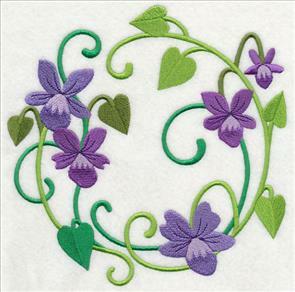 7.78" x 7.81" and 6.90" x 6.93"
Violets and wood sorrel are gorgeous additions to this set of Irish wildflowers. 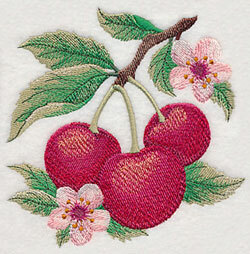 Add to either side of a tote bag, a set of framed pieces, or on a placemat. Maureen was particularly excited about the prospect for a wreath of all shamrocks. What a brilliant idea! 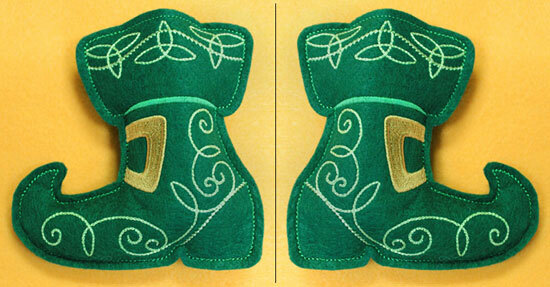 This Irish design is perfect for stitching for St. Patrick's Day, or to show off your Irish roots. 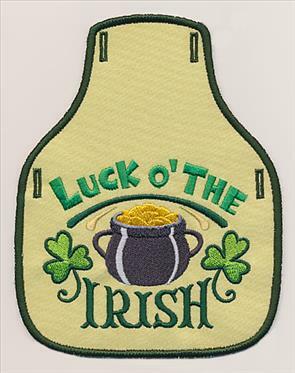 7.80" x 7.50" and 7.07" x 6.81"
6.06" x 5.82" and 5.06" x 4.87"
Add Irish beauty to any embroidery project with these eye-catching designs. Get the designs individually by clicking the links above, or all at once in a pack now! 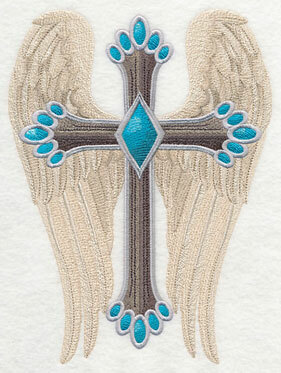 Sam was looking for some cool crosses to embroider on the back of a denim jacket, and we loved her idea! 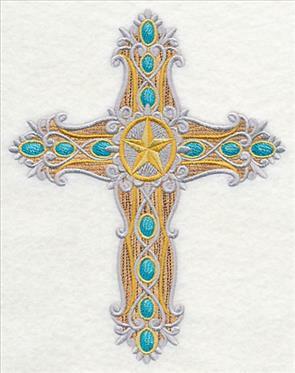 She was particularly interested in crosses that feature a hint of western flair. Thanks for the suggestion, Sam! 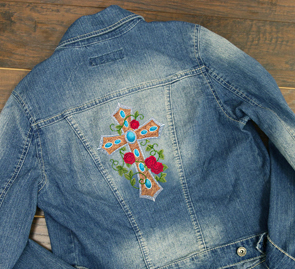 6.85" x 10.03" and 5.87" x 8.59"
5.34" x 7.81" and 4.69" x 6.86"
These crosses are fabulous additions to denim jackets, like the beautiful example shown here. The denim Fabrics 101 page demonstrates how to customize your denim apparel, home decor projects, and more! 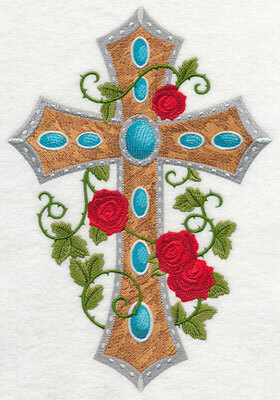 These brilliant crosses are equally stunning on pillows, wall hangings, framed pieces, and more. Pick your favorite to stitch, or use them all! 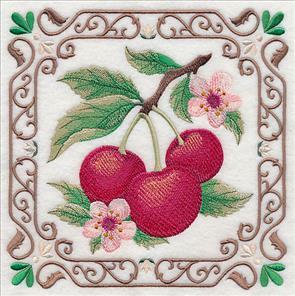 6.90" x 9.22" and 5.84" x 7.80" and 4.85" x 6.48"
Linda loves the designs from Fruit and Tiles designs, and requested we add purple plum and bright cherry versions to the website. Alongside each tile design is a single fruit to coordinate. 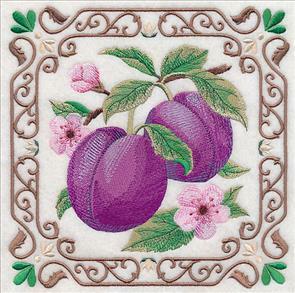 7.79" x 7.77" and 6.92" x 6.90"
4.84" x 4.97" and 3.76" x 3.86"
These tasty designs are perfect for adorning kitchen projects, such as towels, placemats, and aprons. The luscious fruits and blossoms are beautiful both framed in the wrought iron-inspired border and on their own. 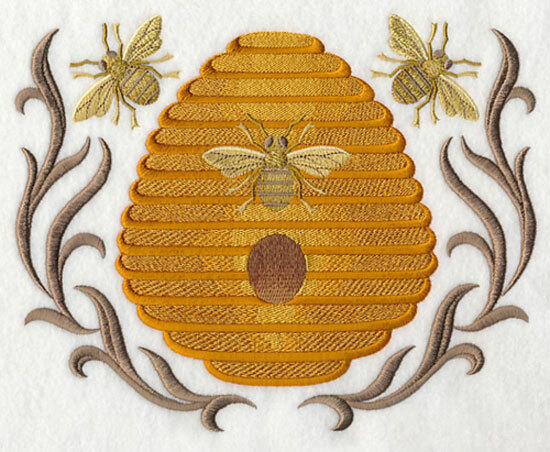 4.86" x 4.89" and 3.86" x 3.89"
Yvonne has the French Napoleonic Bee design, and would love to stitch it with a coordinating beehive on a beautiful set of linen towels. What a great idea! The pair would also look striking on pillows, wall hangings, and more. 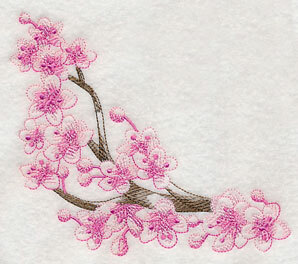 8.63" x 6.86" and 7.36" x 5.84" and 6.11" x 4.85" and 3.88" x 3.13"
Marsha is looking ahead towards spring, and wanted to celebrate with a batch of cherry blossom designs! 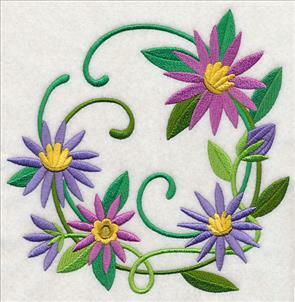 These striking blooms are always a popular embroidery motif, and are stunning on any project. 7.75" x 7.80" and 6.90" x 6.95"
5.90" x 5.80" and 4.62" x 4.58"
It's two designs in one! 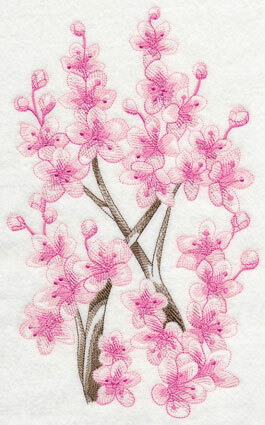 By simply rotating this beautiful spray, we were able to give the cherry blossoms a whole new look. Add to bolster pillows like this one, or stitch on placemats, table runners, and more. 6.88" x 11.23" and 5.74" x 9.38"
4.76" x 7.78" and 4.19" x 6.85"
This eye-catching border is a simple, yet sweet way to update tea towels, canvas tote bags, and other low-nap projects. Stitch atop smooth, neutral fabrics for best results with this light, sketch-style design. 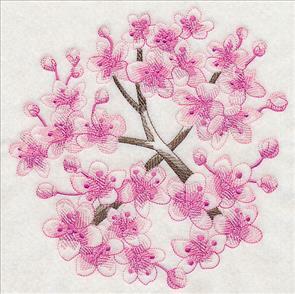 A blooming cherry blossom corner finishes off this set of extraordinary floral designs. 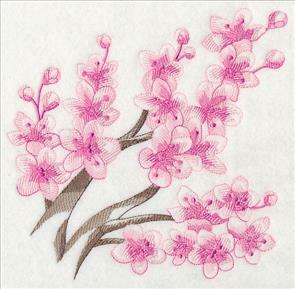 Stitch on a pocket, or on a napkin for a terrific embroidery embellishment. 5.94" x 5.85" and 4.88" x 4.80" and 3.89" x 3.83"
Purchase these cherry blossom designs individually by clicking the links above, or get all of the fantasy flourish designs in a pack! 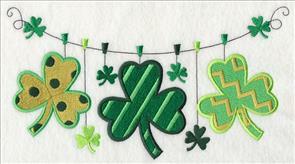 Mary Margaret is from Ireland, and wanted a few Irish clotheslines to stitch on t-shirts, tote bags, and more! 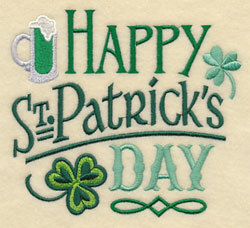 Here bright green shamrock and the word "Irish" shine on these designs. 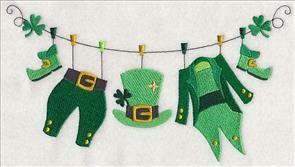 9.37" x 4.91" and 7.78" x 4.08" and 6.85" x 3.59"
Clothesline designs are some of the most popular on our website, and these are the perfect way to use them to celebrate St. Patrick's Day! 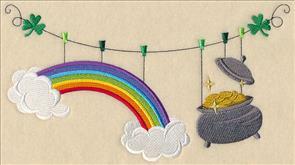 A set of leprechaun clothes hang on the line; you'll be sure to find the pot of gold at the end of this rainbow. 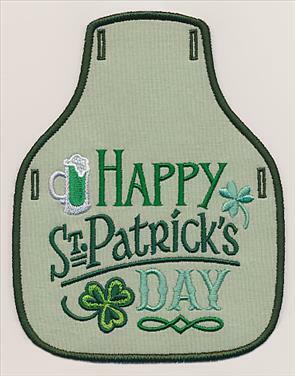 9.38" x 5.26" and 7.80" x 4.38" and 6.84" x 3.84"
Judith likes the bottle apron designs that are currently available, and was wondering if we'd ever considered adding a few St. Patrick's Day-themed aprons. 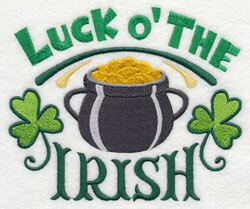 She has several Irish friends and would love to give these as a gift. Thanks, Judith! 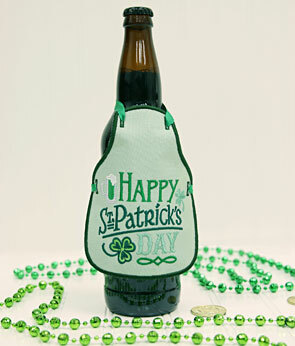 5.40" x 4.86" and 3.62" x 3.26"
Charming bottle aprons are the perfect way to dress up a bottle of your favorite brew on St. Paddy's Day. Simply follow these project instructions for our best tips and tricks for making in-the-hoop bottle aprons. Each of the bottle aprons also features a coordinating individual design. Stitch on a tea towel, apron, or gift bag for the perfect pair! 5.87" x 4.86" and 3.71" x 3.07"
The in-the-hoop witch's boots, Santa Claus boots, and elf boots were such a hit, requests came pouring in for leprechaun boots, too. Get the step-by-step instructions for these in-the-hoop boots here. 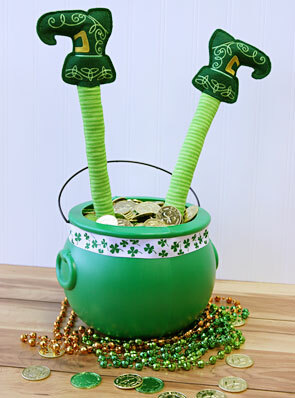 Display the bright green boots sticking out of a pot of gold, peeking out from under a door, or hanging off your mantelpiece. This free tutorial explains how to make the in-the-hoop boots, plus provides even more idea for displaying them! Lee has several friends who enjoy both crafting and reading and was hoping for a few bookmarks that showcase a sewing theme. These beautiful in-the-hoop bookmarks are a bright and beautiful way to keep track of your page while reading; stitch the coordinating designs on book covers, or crafty projects, too! Master making in-the-hoop bookmarks with the steps found in this free tutorial. 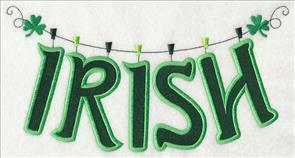 1.48" x 5.02" and 1.15" x 3.87"
"S-E-W" stitched to resemble applique letters adds a crafty look to this in-the-hoop bookmark and coordinating design. 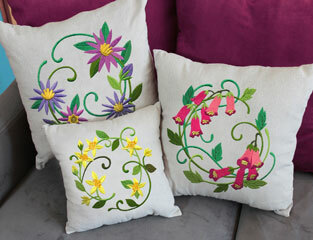 Use your favorite fabric and thread colors to personalize the too-cute crafty motif. 1.95" x 5.14" and 1.46" x 3.85"
Showcase your love for sewing with this hearts-and-sewing notions version! Three spools of thread add even more crafty appeal. 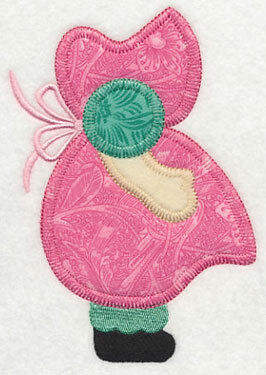 Our best tips and tricks for embroidering these bookmarks are right here. 1.72" x 4.46" and 1.50" x 3.87"
In addition to the in-the-hoop bookmarks, three new freestanding lace bookmarks are available in crafty themes to help you mark your place in your book. 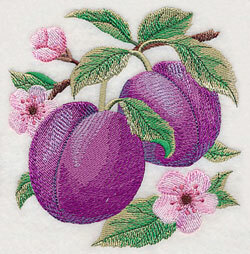 Find the free tutorial for embroidering lace right here. 2.92" x 6.90" and 1.67" x 3.90"
Keep track of where you are in a book or magazine with this cute bookmark! The letters for "sew" and a collection of crafty notions make these lace bookmarks perfect for any sewing aficionado. 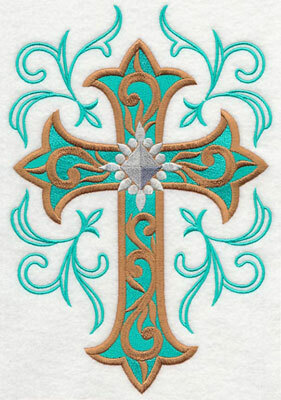 Pick your favorite colors to stitch them in to customize the design, or choose special colors for friends and family! 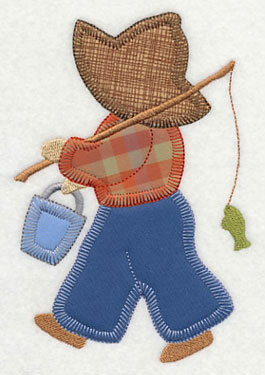 2.91" x 6.90" and 1.64" x 3.88"
Antoinette liked the style of our classic applique designs featuring Sunbonnet Sue and Fisherman Fred, and was hoping we would create accompanying heirloom applique versions as well. Here you go, Antoinette! 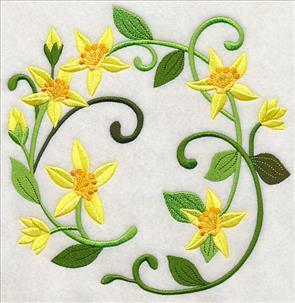 Follow the steps in this tutorial to master heirloom applique. 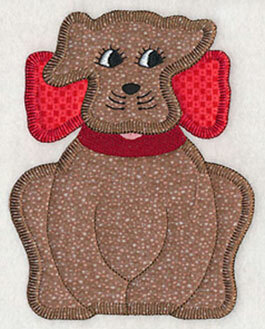 In addition to Sue and Fred, the Gingham Dog and Calico Cat have also been created in the heirloom applique style. 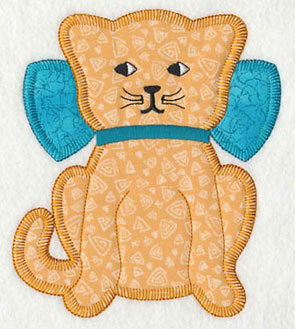 Find the classic applique dog here, and the cat here. 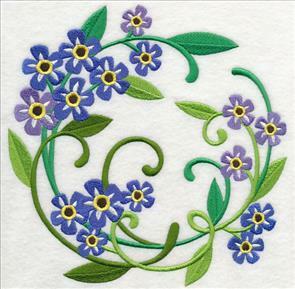 5.19" x 5.99" and 4.36" x 5.03" and 3.37" x 3.88"
These applique designs are particularly fabulous on quilt blocks -- use to make a quilt block pillow, table runner, or a quilt itself! 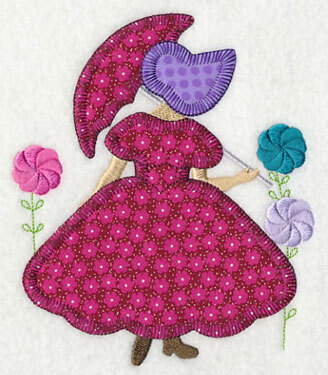 Find the version of the umbrella girl in the classic applique style here. 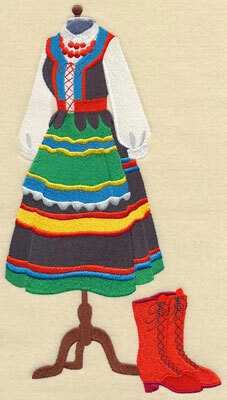 5.12" x 6.00" and 4.28" x 5.01" and 3.33" x 3.90"
Carol has stitched all of the Polish folk art designs on the website, and many of the global dress form designs. 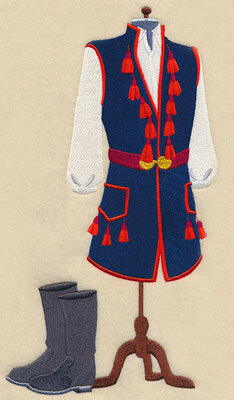 She requested we add a Polish dance dress form. Thanks for the suggestion, Carol! 6.35" x 11.73" and 5.09" x 9.42"
6.28" x 11.51" and 5.04" x 9.24"
4.18" x 7.67" and 3.67" x 6.73"